Holy twinning, Batman. 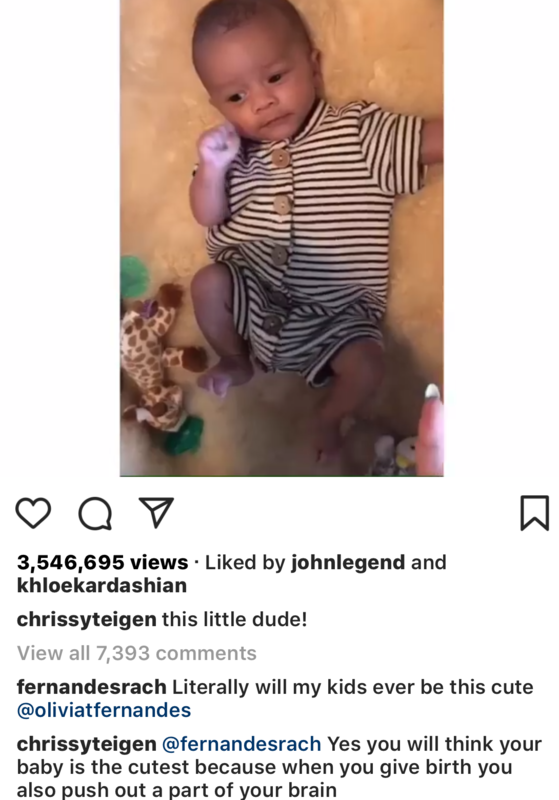 Chrissy Teigen’s latest upload to Instagram proved three amazing things and her followers can’t get enough of it. Firstly, hundreds, potentially thousands of people have decided that she gave birth to an exact version of her husband – singer John Legend – in miniature. They were not only freaked out by catching a glimpse of baby John in newborn Miles, they had complex feelings about the fact that Chrissy had to lug around a baby for 9-ish months, and then have him not look very much like her at all. They felt this was a sort of baby treason and honestly we totally get it. “You did all that hard work for him to look like John lmaooo,” a fan posted under the video. “It’s crazy how you carry your child 40 weeks but they end up looking like their father!! !” someone else commented. That said, tiny Miles is the very definition of joyful cuteness and we would not wish him to be any different because ALL OF THE MOTHERLOVING CUTE! “Oh my goodness!!! It’s a pocket sized John Legend!!! How precious,” was another verdict and SAME. Baby Miles has totally nailed what’s now being called ‘the Arthur fist’. If you’re just catching up on this, the internet has decided that John Legend look a lot like 00s TV character, Arthur. The meme game surrounding this assertion has been strong, and Chrissy’s video of Miles shows that it may be a generational thing! “He’s got the Arthur fist down!👊🏼” another follower was quick to point out and we could not be more delighted by this development. “What happened to John? Did he shrink himself?” someone else quipped. The other thing Chrissy proved was that she’s perfectly able to distil parenthood into ridiculously accurate one-liners! Other parents were relieved to finally talk about their baby brains with someone super famous!